PokerStars is welcoming Portuguese players into its European shared liquidity market with a €5,000,000 guaranteed TRIO tournament series. 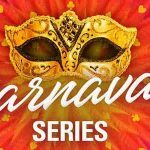 The series is being supported by ten-times-daily freerolls, a deposit freeroll offer and “Second Chance” freerolls giving away a further €25,000 in tournament entry tickets. Last week was a very busy week for PokerStars-centric news. After smashing its SCOOP guarantees by 40% and launching the new Showtime Hold´em game, the site announced three new ways to win a Platinum Pass for the PokerStars Players Championship. Also last week, Portuguese players joined players from France and Spain in PokerStars´ shared liquidity market. The union of Portugal, France and Spain in PokerStars´ shared liquidity market is not absolute inasmuch as Portuguese players do not have access to shared liquidity cash games (excluding Zoom Poker) due to a rake percentage cap in Portugal. Nonetheless, PokerStars has decided to celebrate by hosting a €5,000,000 guaranteed TRIO tournament series from next Sunday, June 3rd. PokerStars´ TRIO Series kicks off with an incredible €50,000 guaranteed event with a buy-in of just €1.00. At the same time, the site will be running the first of twelve flights for its €250,000 guaranteed “Hercules” event. Each flight costs only €20.00 to enter. A further six events scheduled for the opening day have combined guaranteed prize pools of €725,000. 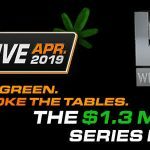 Although the schedule consists of just one non-NLHE event (the two-day Progressive KO PLO Main Event on June 5th), there is a rich variety of tournament formats to choose from. As well as Heads-Up, 4-Max, 6-Max, 8-Max and Full Ring tournaments, PokerStars is laying on a schedule featuring Bubble Rush, Win the Button, Big Ante and Ultra KO events. The €500,000 guaranteed TRIO Main Event is a two-day tournament that starts on Sunday 10th June at 9:00pm (CET) and concludes the following evening. 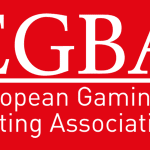 The tournament has a buy-in of €250.00, a progressive KO format and five hours of late registration – by the end of which the starting stack of 25,000 chips will be the equivalent of twenty-five big blinds. PokerStars is doing its best to ensure the TRIO Series is a success by supporting it with hundreds of free seats and satellite entries. Players already playing on the shared liquidity platform will have noticed Main Event seats being added to the prize pools of regular tournaments, plus there is a comprehensive StarsCoin Steps program guaranteeing 75 seats in the €500,000 guaranteed tournament. However, the promotion attracting the most attention is the ten-times-daily freeroll tournaments awarding twenty €5.00 TRIO tickets in each. Tickets won in the freerolls can be used to enter any of the eight events with €5 buy-ins in the TRIO schedule or any of the hundreds of €5 buy-in satellites to more valuable events in the series. There will also be a special depositors freeroll tournament on Saturday June 9th awarding sixty €250 TRIO Main Event entries (players must use the PokerStars bonus code “TRIO” when making a deposit to be eligible for the freeroll), plus daily “Second Chance” freerolls from Sunday June 3rd with €2,500 in TRIO tickets up for grabs in each. 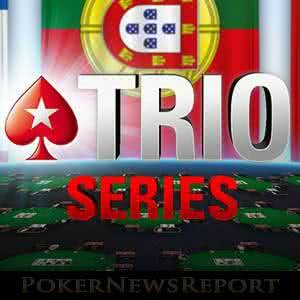 Will You be Playing in PokerStars´ TRIO Series? Although PokerStars´ TRIO Series has been designed for players from France, Spain and Portugal, players from some other countries are eligible to play in the events and benefit from the promotions. To find out if you are eligible to play in PokerStars´ TRIO Series, read our article on “How to Create an Account on PokerStares.es. The article not only explains why players from certain jurisdictions can play on PokerStars.es (and others cannot), but also provides information about registering and verifying an account, the available deposit options, and the differences between the PokerStars.es platforms and the .com and .eu platforms. 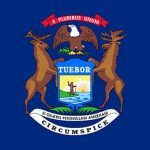 Noticeably, no re-entries are allowed in Knockout events – i.e. the TRIO Main Event. If you are eligible and wish to play in PokerStars´ TRIO series, remember to use the PokerStars Marketing Code “PSA225” on the second page of the account registration form and make a minimum deposit of €20 before 7:00pm (CET) on Saturday 9th June to be entered into the special depositors Main Event freeroll tournament the same day.